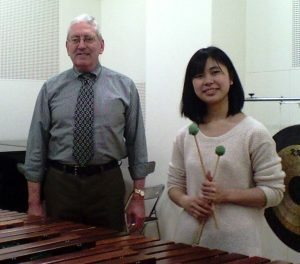 A marimba lesson with Eimi, a career-track percussion student at the Showa Academy of Music and Arts in Kawasaki, Japan – December, 2013. As mentioned in previous blog postings, I regularly receive emails containing questions about percussion instruments, performance and pedagogy. One such question was emailed to me recently. Question: How would you start a beginning mallet student? What exercises and books that you would use to have the player develop a feel for the instrument? How would you instruct the student to practice with purpose. Not to waste time not getting anywhere. My Response: Your questions are good. First, a disclaimer: virtually all of my experience in teaching private lessons has been with highly motivated, career-track students – in North America and Japan – who have already been studying percussion for years. I have also been a facilitator in hand-drumming ensembles for general grade school children who are not going to be music majors. My experience in working with beginning students in private percussion lessons is minimal. That being said, I can offer some general principles that I think are common to teaching instrumental music in private and small group lessons. There is no simple or one-size-fits-all answer. While some approaches (pedagogies) may work for many, I don’t know of any that works for all. The main variable is the teacher – his/her experience, biases, and resources. The teacher’s job in each private lesson is to observe each student, to assess each student’s needs, and to help each student to address those needs. Is the student’s posture and mallet grip natural and without tension? Is the student experiencing stress or anxiety? Is the student’s demeanor relaxed? Is the student capable of handling the material that was assigned? Does the beginning student already know how to read music? Has the student studied any other instrument(s)? Does the student own or have access to an instrument(s) for practice? Does the student have a support system (parents, teachers, friends, facilities)? that the overall atmosphere in the lesson is one of FUN – maybe sometimes SERIOUS fun – but fun nevertheless; NEVER abrasive or demeaning. The material from the very beginning should include whole pieces of music, preferably melodies by the great composers (e.g. “Twinkle, Twinkle, Little Star” – Mozart’s melody). Regarding practice for beginning students, I would advise starting with a suggestion of only 20-minutes at a time starting with one practice session per day. If the student practices more than that, fine, but the guiding principle would be that the student’s own motivation should be the driver. The student should always know what the goal is for the next lesson – for example, to play a scale, arpeggio, or “Twinkle Twinkle” all the way through at least X-number-of-times without missing any notes. It would be possible to write a rather large book on the questions you have asked, but short of that, I hope this is helpful. Please let me know how your teaching works out. I send best wishes. PS – There is a backlog of questions received, and it’s my intent to post responses in the days ahead, as time allows. Practice – Q. + A.